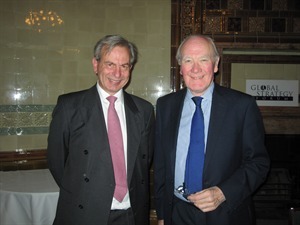 Peter Collecott CMG (UK Ambassador to Brazil 2004-2008) gave a lecture to Global Strategy Forum in an event chaired by GSF Advisory Board member, Sir Menzies Campbell QC MP on Monday 17th October 2011. Peter Collecott addressed the question, ‘Is Brazil a Future Global Power’ in a comprehensive and authoritative lecture to Global Strategy Forum. He said that Brazil had been one of the winners from globalisation and that they were likely to become a more important political and economic power, although, as the Brazilians themselves describe it, they would be ‘a different kind of major power’, i.e. relying on soft power not hard power and on negotiations rather than coercion, evolutionary not revolutionary, consensus-driven and moderate, and the upholder of multilateral institutions and the rule of law. He thought the prospect that Brazil would want to develop more hard power, such as a military naval presence in the South Atlantic, was entirely possible, but ‘off the present radar screen’. He looked at the implications for British policy and spoke of how, within a changing world, we need to adapt and to find out where we fit in within this new world order word where we have far less influence than hitherto. He stressed the need to continue to build more substantial bilateral relations with countries like Brazil and the other BRICs and said that while trade was important, these relationships should not be just about trade. Instead, we ‘have to understand what things they also want from us, which might be investment, it might be access to capital markets, it might be technology and know how, it might be scientific and technical collaboration and knowing how to do innovation properly and get that into the real economy. It might also be things we can share in – trade policy, sustainable development, even non-proliferation’. He felt that perhaps the most important thing for British policy was for the UK to get out of a traditional mindset and into a new mindset and to develop a relationship with Brazil genuinely based on partnership and not just rhetorically; and a relationship which is actually built on trust and not just on opportunism, concluding that, ‘if we can do that, they will be great partners. If they believe that we are opportunistic or that we are being paternalistic and insincere, then actually we are not going to build the kind of relationship that we need in order to find that position in the new global constellation’.